by: Ian GordonIssues: November / December 2002. Tags: Innovation. Categories: Strategy. No one company has written the book on CRM. And rightly so, says this author, whose examination of how companies practice this much-talked about discipline led him to develop comprehensive guidelines for enhancing a company’s returns from CRM. There are many definitions for CRM, and best-practice companies adopt one that is shared across the organization. Otherwise, the very term “CRM” will conjure up many things to different people and lead to confusion. These companies see CRM as a series of strategies and processes that support and execute a relationship vision for the enterprise. In their eyes, CRM is a series of strategies and processes that create new and mutual value for individual customers, builds preference for their organizations and improves business results over a lifetime of association with their customers. With this definition, an organization can focus on developing the only asset of the enterprise that matters in the long term, progressively deeper relationships with valuable customers. By sharing the definition, they can put the customer first and avoid sending their staff into cycles of interminable CRM programming. These organizations then create a vision for how CRM will change their companies. Some develop the vision according to attributes that are important to both the customer and the company. These include attributes that affect customers’ perceptions of value, how they can bond with the organization, product and company preference and purchase intent. This vision sometimes changes as the firm gains experience in CRM and as technology makes new things possible. 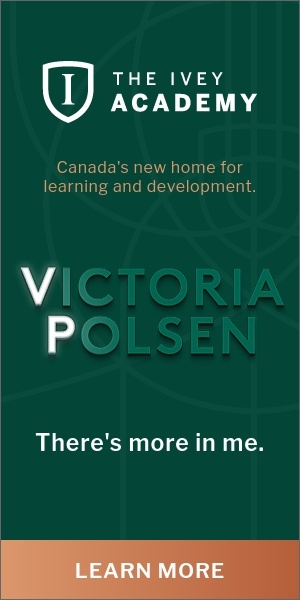 For example, at a major Canadian bank, the vision has evolved. Initially the vision was associated with the development of customer information systems. Personnel then identified five components that the firm built in stages to implement key aspects of the vision. These components were associated with developing a complete, real-time, single and accurate view of each customer. Simple though it sounds, it took several years to accomplish given the sheer scale of the enterprise. In this example, the vision was initially conceived in terms of a strategic capability, that of customer information. Today, the vision is more focused on the delivery of differentiated value propositions through products to customers. This illustrates that once best-practice companies put a strategic capability in place to enable CRM, they tend to modify the vision to use the capability for customer bonding, a learning relationship and competitive advantage. Strategic capabilities are even more important than specific strategies in best-practice CRM companies. We discuss this below. At the outset especially, best-practice companies develop their CRM plans in terms of strategic capabilities rather than strategies per se. This helps to ensure that the company can adjust to a wide variety of marketplace and industry changes without affecting the main thrust of the plan. For example, we recently reviewed the plan of an organization considering what to do with CRM in the wake of the events of September 11. Prior to our involvement, it was debating the merits of various programs while the key strategic capability it needed – in this case, developing an ability to listen and respond to customers in a timely manner – was not identified nor discussed. Technology: the technology that supports CRM.People: the skills, abilities and attitudes of the people who manage CRM. Process: the processes companies use to access and interact with their customers in the pursuit of new value and mutual satisfaction. Knowledge and insight: the approaches the company uses to add value to customer data so that they acquire the knowledge and insight needed to deepen the relationships that matter. – Customer collaboration to jointly plan and create new value, differentiated by class of customer. – Collaboration with distribution channel intermediaries and suppliers to achieve the value each end-customer wants. Many companies measure the return on investment (ROI) of their CRM programs. Indeed, firms often embarked on a CRM journey because the performance of specific programs could be measured with more assurance than their traditional means of promotion. Best-practice companies know the ROI for each of their programs and use this knowledge expeditiously. For example, a major casino understands guest spending and can rapidly relate this data to the investment the casino made to attract the guest. This leads to new offers affected by the amount the guest spent (lost) and the casino’s investment in the guest. Measurement allows the casino to limit “free ridership,” the provision of offers to visitors who would return anyway without any incentives. Measurements such as these also help a company decide how much to invest to keep existing customers and how much to spend to attract new customers. This is effectively changing the paradigm in media spending from considering costs in dollars per thousand people to dollars per priority customer. In addition to the measurement of behaviours, best-practice companies measure attitudes. For example, customer satisfaction and favourability (purchase intent) are measured. For business-to-business purchase decisions, customer satisfaction measurement occurs across the enterprise and scores are weighted to arrive at an overall level that allows satisfaction levels to be compared over time. Best-practice companies also understand their performance compared to other suppliers for that account. They track their share of each customer’s spending. By using data such as these, companies are beginning to target specific competitors to transfer customer share one customer at a time and thereby to gain market share. More generally, best-practice companies develop selected competitive measures to help ensure that the performance of their C RM initiative is leading to superior customer relationships. the amount and nature of customer data and the processes by which value is added to the data. how companies compete, especially for those firms that use CRM to compete on scope. Most companies obviously see solid financial data as important for management, leadership and control. They have a financial department and a Chief Financial Officer (CFO) with custodial responsibility for these financial data, including security and management, and the processes by which value is added. Increasingly, companies are coming to believe that customer data are as important as financial data. Some best-practice firms are establishing custodial responsibility for customer data and value-added processes in the same way that they secure and manage financial data. This responsibility includes managing the customer data warehouse and the approaches that add value to customer data. It can also include mechanisms for providing services from a centralized department to the lines of business in decentralized companies. Companies competing on scope change their structure frequently as they begin to sell what customers want rather than what the firm has made. This leads some companies to distribute the complementary products or services of others, including customers and competitors, and to sometimes sell their own products and services through others. This can be a marked departure in strategy for those companies that built their businesses through economies of scale. Associated with these changes are new roles and responsibilities for an expanded array of stakeholders and how they interact in the value chain. The challenge for organizational design is to accommodate these changes without disrupting the firm’s existing business. Because the company competing on scope often has fewer but more important stakeholders, CRM companies are beginning to organize around their stakeholders to create the value each wants. For example, professional services firms have client-service teams for their most important clients with representatives of both the firm and the client on the teams. In another example, a major logistics company has established customer teams that bring together the various processes by which the company interacts with its priority customers. Members of the customer teams are drawn from many areas within the firm, such as marketing, sales, advertising, research, operations and finance, as well as their counterparts from the customer. In this case, the management of the customer team falls to sales, which manages all the processes by which customer value is created – an obviously very different role than the historical role of the sales department. 1 Providing a compelling vision to keep the organization focused on CRM strategically, tactically and in real time, continuously and mutually with key stakeholders. 2 Bringing all customer data together in a single location, aligning processes among stakeholders in the service of the end customer, and smoothly integrating the CRM activities of other executives, lines of business and functional areas. 3 Selecting among the often competing requests for projects, funds and people, in accordance with the CRM vision, such as the issue of who is promoting the project, what technology can accomplish or whether new or existing customers merit the most attention from CRM. 4 Helping management and staff at all levels to understand CRM concepts and the firm’s vision for CRM, as well as communicating customer, market and profitability data to describe the firm’s progress as it proceeds on its CRM journey. 5 Setting expectations to help individuals and groups align their performance with the goals for CRM. Many companies have a large variable component in their compensation structure, for example, which can reward behaviours that run counter to CRM principles. People need to know the link between CRM and their own success or the initiative might be seen as just another program. Among the many aspects of change management organizations typically employ are the recognition of individual and group achievements, and case study successes. 6 Ensuring that a sufficient flow of people, time, money and knowledge goes to the CRM areas that need these resources. 7 Ensuring that that financial and operational controls are in place to monitor and improve customer performance and that any trust that might have been extended to any stakeholder under the CRM vision is not abused. What is the firm’s vision for its relationships with all stakeholders, in addition to key customers? What new capabilities does the organization need to achieve the CRM vision? 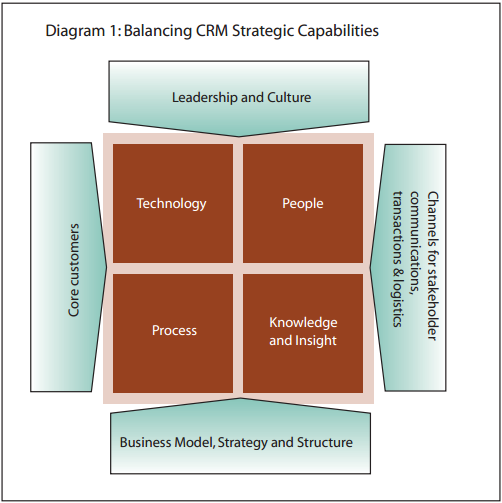 How will tomorrow’s CRM company be structured? What roles must management take to implement the vision? What measurements must be used to assess CRM performance? How should all stakeholders be aligned to create the value end-customers want? Perhaps no company has yet achieved the full potential for CRM. Considering best practices from a number of firms suggest that opportunities remain for all organizations to achieve better results and deeper relationships with CRM.